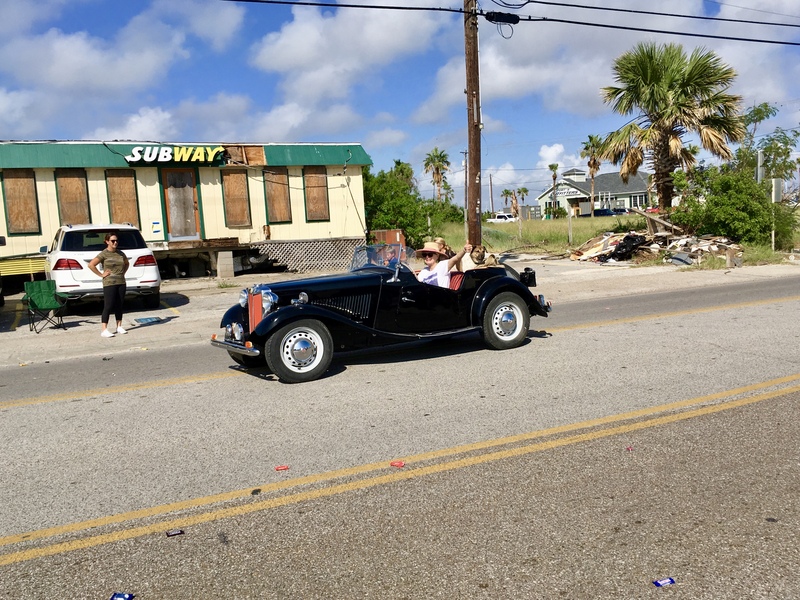 As you may know, Port Aransas was hit hard by Hurricane Harvey. 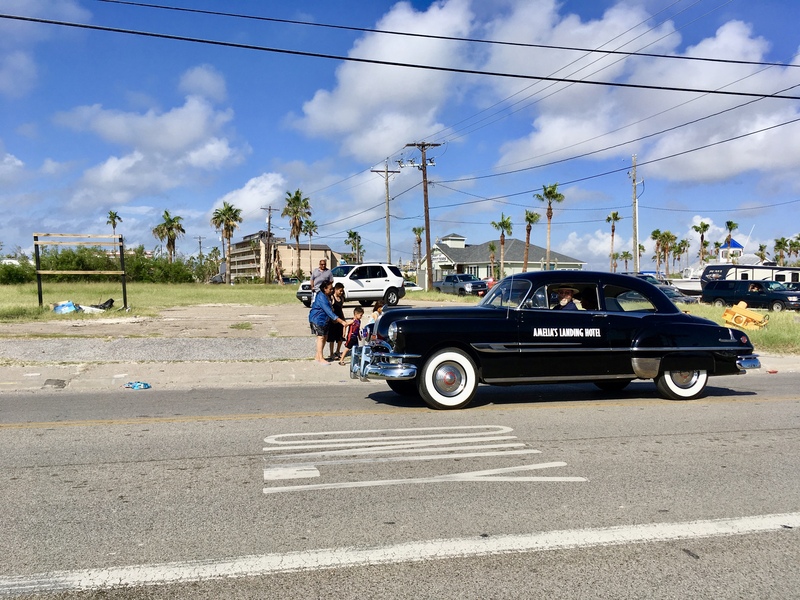 Each year there is a parade and festival honoring Port Aransas’ old town. 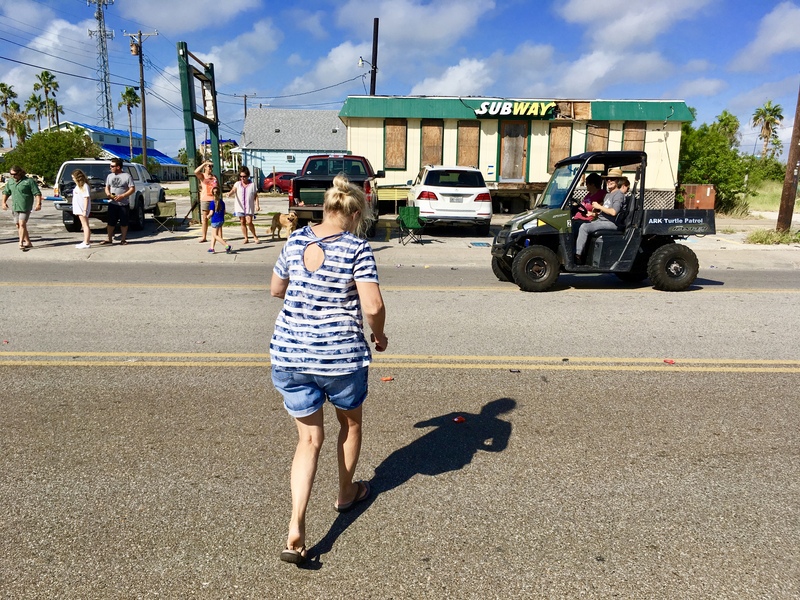 In spite of Harvey and in spite of the devastation especially in old town, the parade and festival continued as usual. I hope you enjoy the photos. With two state troopers in the lead, we are off. The State Troopers who number about twenty have been an immense morale booster to the community. They can’t be thanked enough. Two signs. The first says “Riders of the Storm and the second says “Tell Your Harvey Story,” and a link to do that. 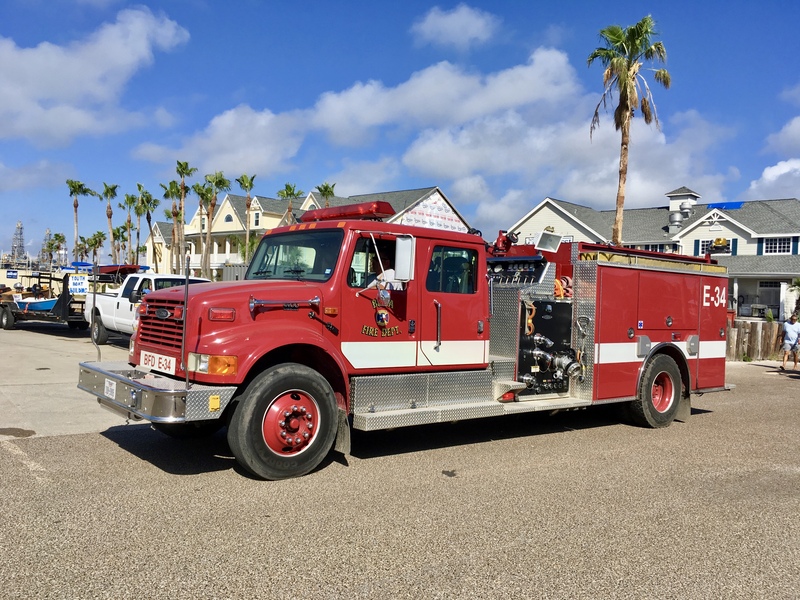 This is a fire truck from Buda, a town near Austin. 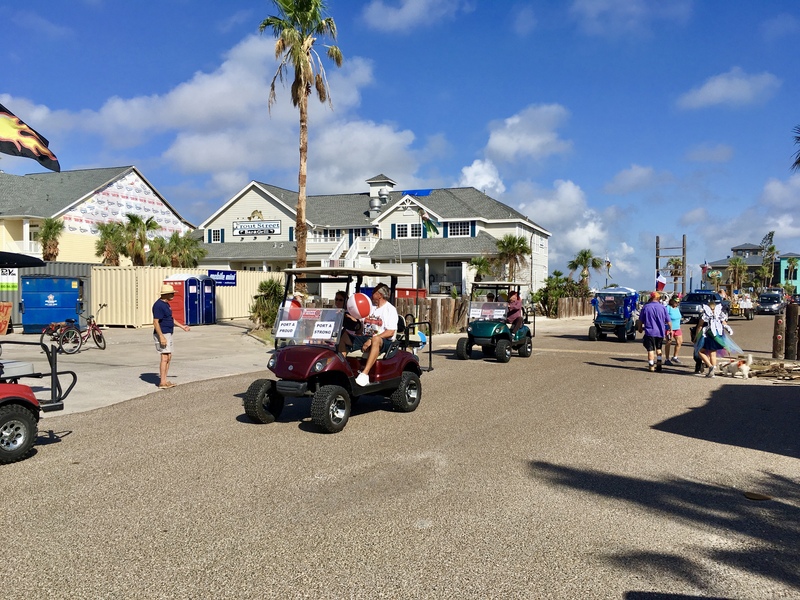 A bunch of golf carts with Port A Proud signs. A big float with the same message. 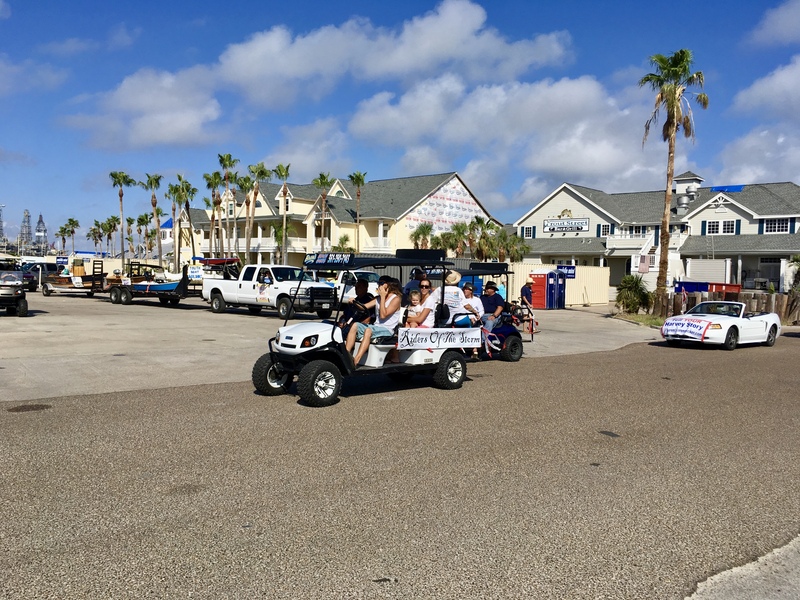 Here is a resident on a three-wheeler with signs that read, Port A Strong Port A Proud. 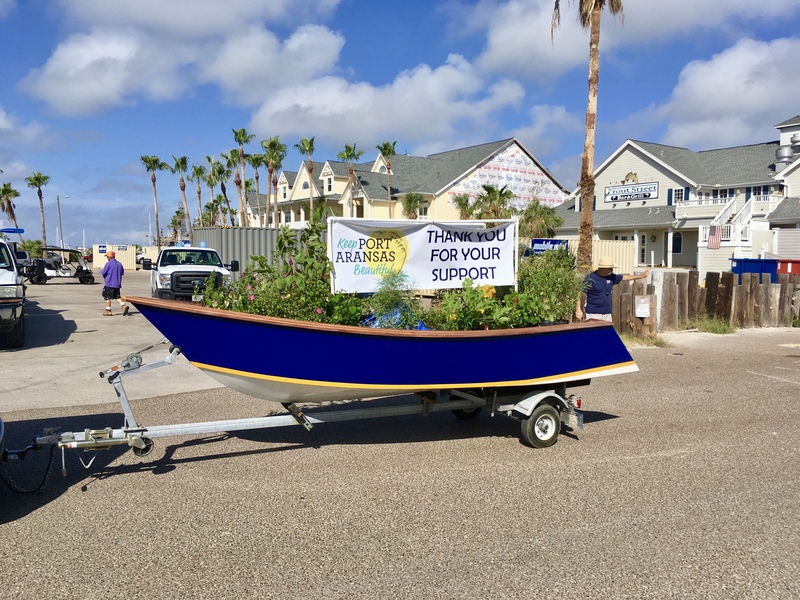 A float from Keep Port Aransas Beautiful. The background has changed a little to show some kids getting candy thrown by the parade participants. A Mid Century Pontiac is very cool. 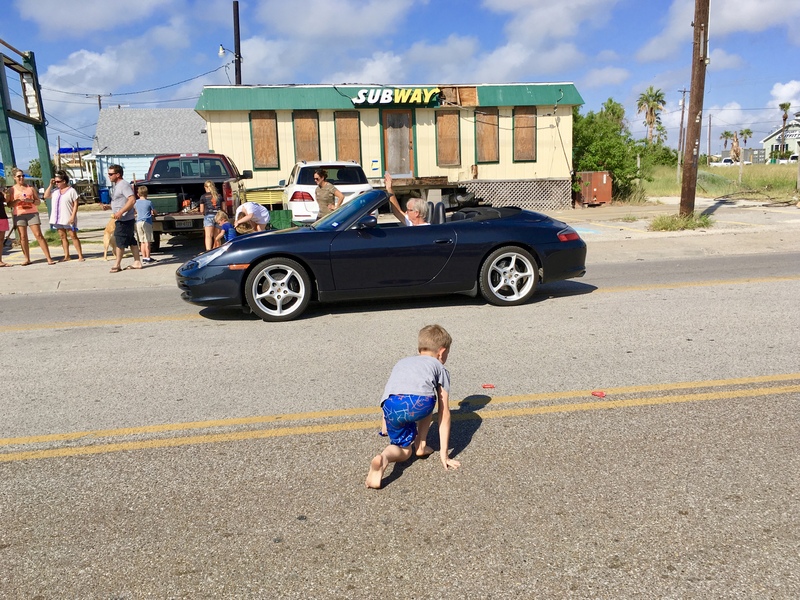 Some residents enjoying the parade and some children racing back to the spectator section with candy. A day school float. 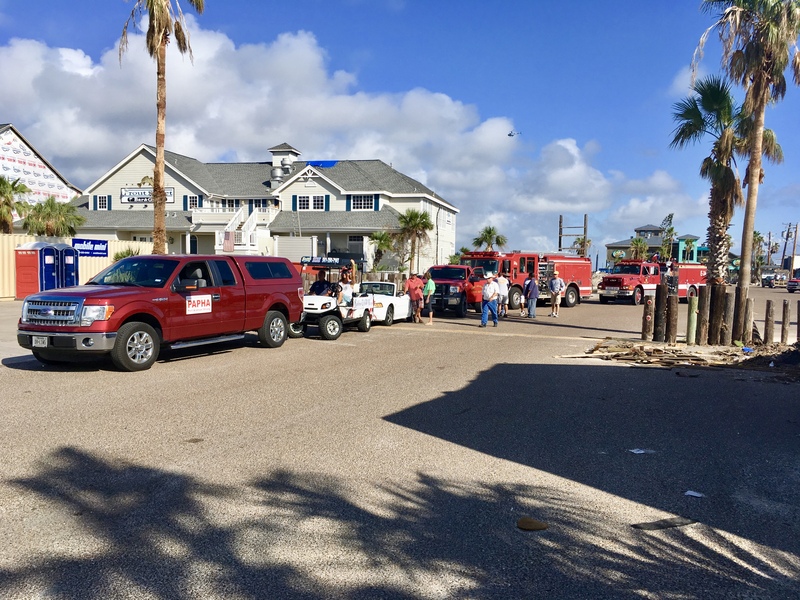 A reminder that the Port Aransas schools are open again. Photo of a good Samaritan getting candy for the children and the ARC turtle patrol in the background. Here is a lovely Mid Century MG with a thumbs up driver. A little boy goes after the candy. Here is the poster announcing the Old Town Festival of which the parade was one item. I purposely did not crop out the backgrounds on the parade route. I think it was important to catch the spirit of the parade in spite of the surroundings. Hopefully, the photos did that. There were way too many to post all of them but maybe you got the flavor. A very uplifting event. Your Views Of The Neighborhood posts always make me want to come down for a vacation. Oh, I’m looking at next summer. We usually try to swing a week at the beach in July or August. 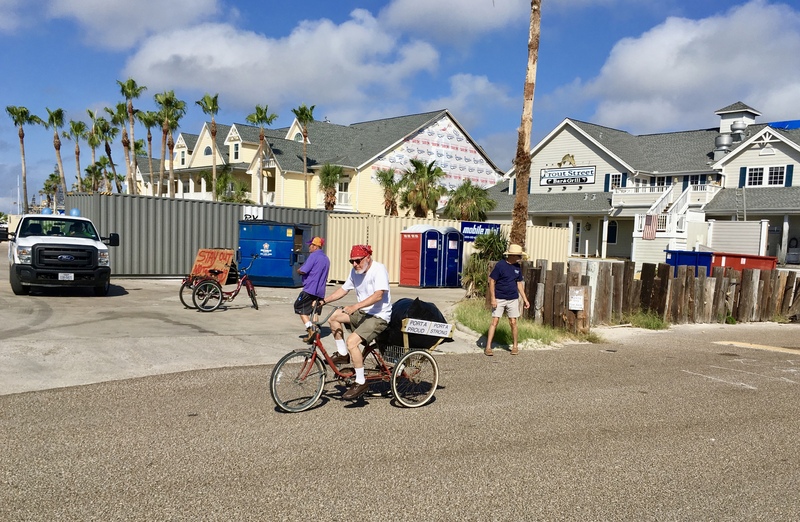 We generally go to Myrtle Beach, but Port Aransas looks like a nice, restful town to soak up some rays, and it wouldn’t be a bad drive from St. Louis–we’d overnight in Texarkana, or someplace like that. I think you would like it. We bill ourselves as a small drinking town with a fishing problem. Definitely my kind of town. You be our kind of visitor too. There is nothing like a parade to lift one’s spirit! Nice to see a bit of Port Arthur! Great photos, John. I like the MG but I love the spirit! MG was cute for sure.Thanks, Dan. So good to see that traditions continue even in the face of adversity. 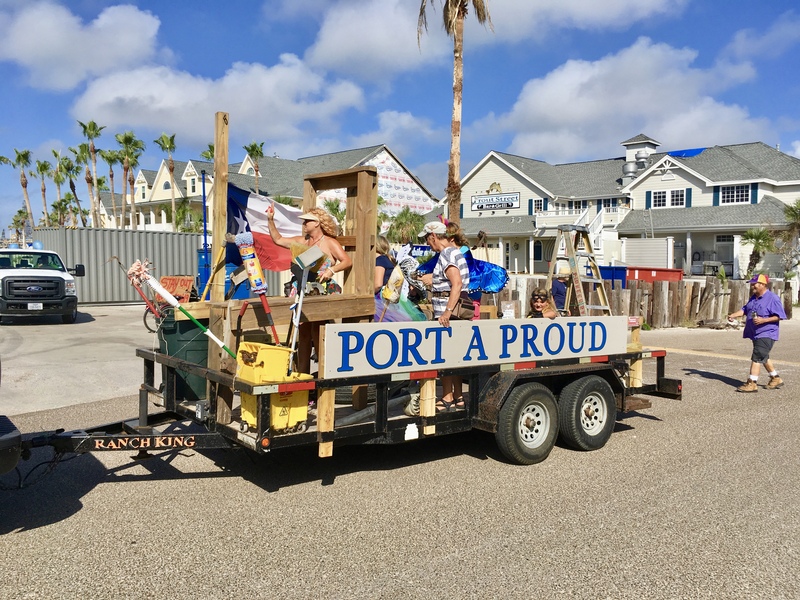 “Port A Proud” really captures this event. I really loved the 3-wheeler and all the smiles. What a testimony to the human spirit! Thank you, John, for the update and the levity. Thank you, Gwen. I had to follow that three wheeler on the way to the parade. A nice selection of photos, John. Boy, that Subway store sure took a beating from Harvey. Thanks for sharing the spirit! Yes it did. Still standing though. Many are not. 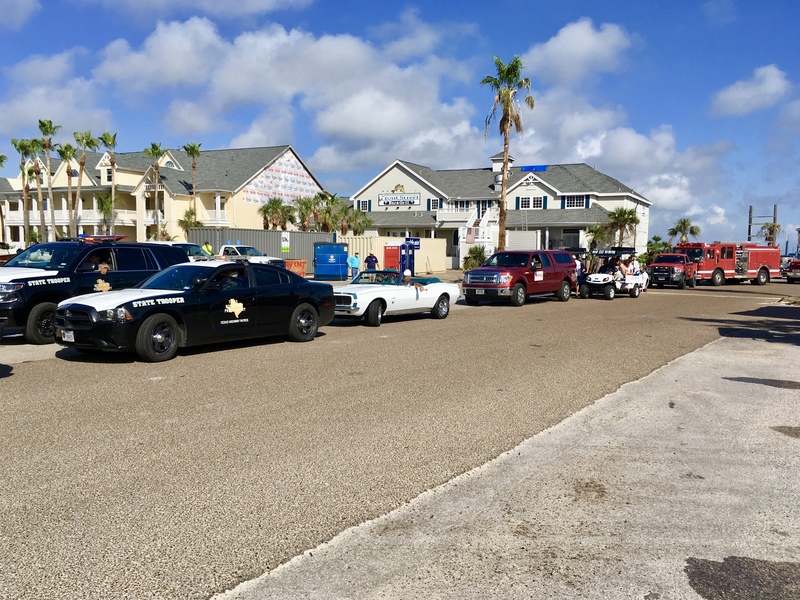 Good for Port A, not canceling this parade! It’s feel-good events like this that keep up morale and encourage forward thinking. Love the contrast between the boarded-up Subway and the clear skies — great day for a parade! How nice to see the town moving on with life and carrying out its traditions. Thanks so much for sharing these wonderful photos, John. Love the old cars! Thanks, Jill. Cars of my youth. Uplifting, indeed. Thanks for sharing the photos, John. Who doesn’t love a parade! 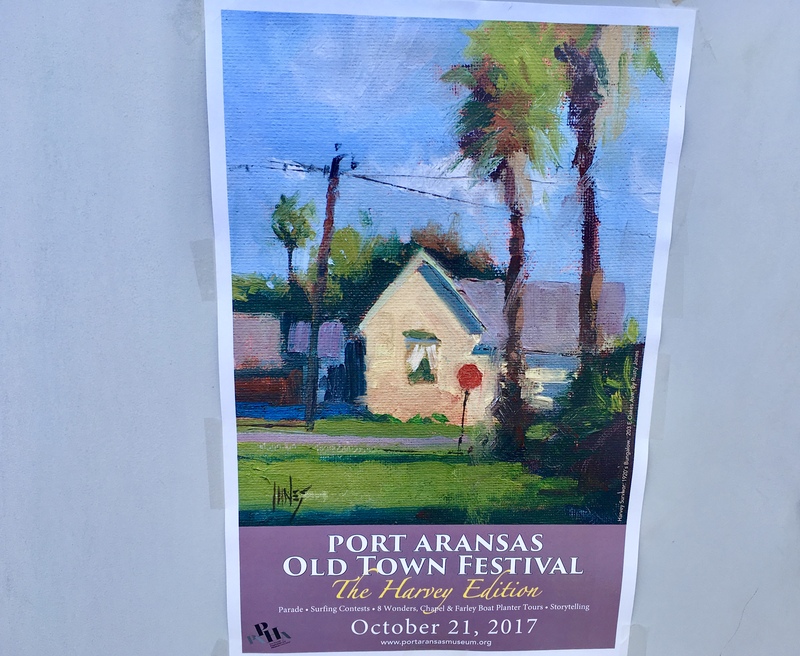 It’s good to see Port Aransas taking the time out for a cherished event. This is just the tonic needed for a town after such devastation. Thank you for the wonderful photos. This is important. You are right, Jennie. Thanks. Wonderful post, John. 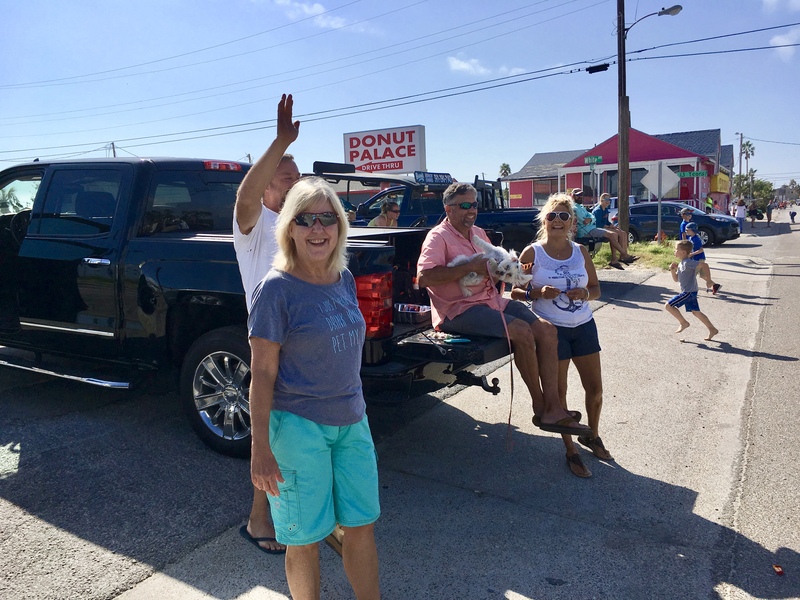 I’m so glad they held the parade — what a way to show the awesome town spirit! I enjoyed seeing the old cars too. Have a hug-filled new week! Thank you. Lauren. I love town parades. Great images John! It looks like a fun day was had by all! It was a little bittersweet since many of the old town folks could not be there. 😦 That is sad, and as you bittersweet. A fantastic “Harvey Edition!” That is the Port A spirit we all know and love. So glad you did not crop the damage in the background! Cheers for all of you!!!! 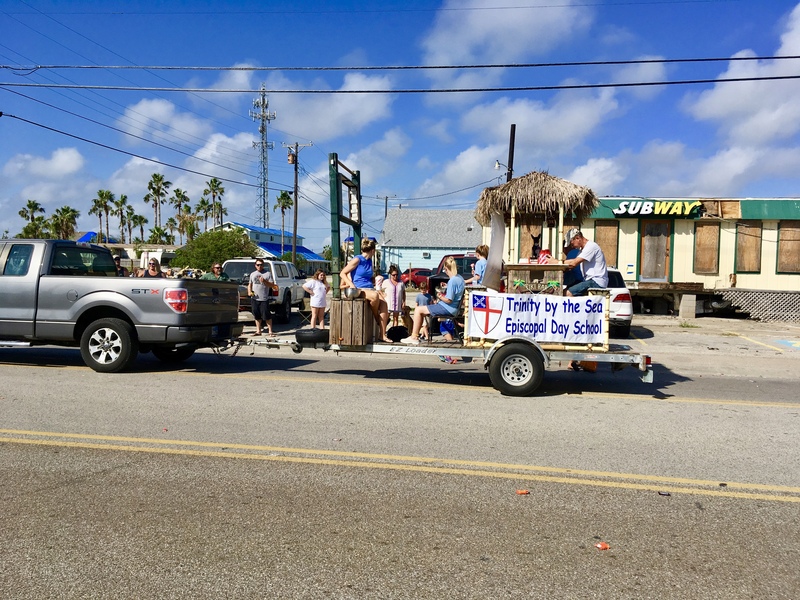 A parade and candy? Yes, please. I got a Tootsie Roll Pop out of the deal. Raspberry. Yum.